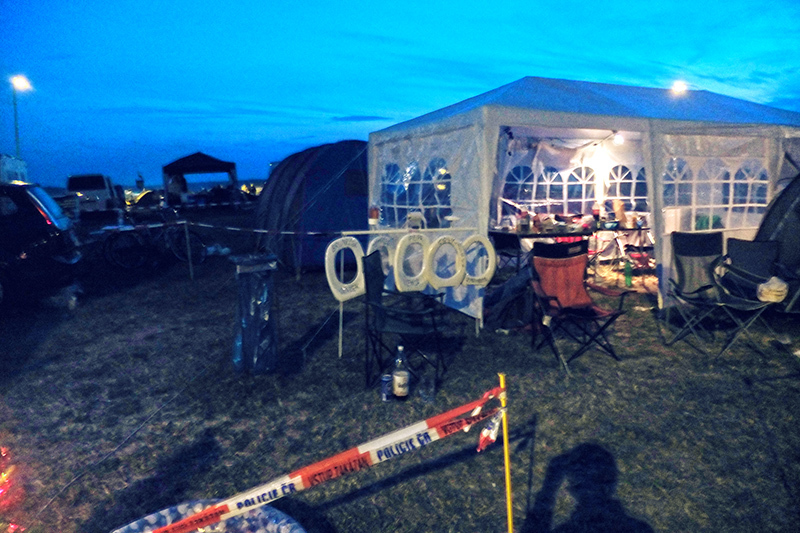 Instead of booking in advance and staying in some hotel nearby we decided to rough it and stay in the campsite next to the track. 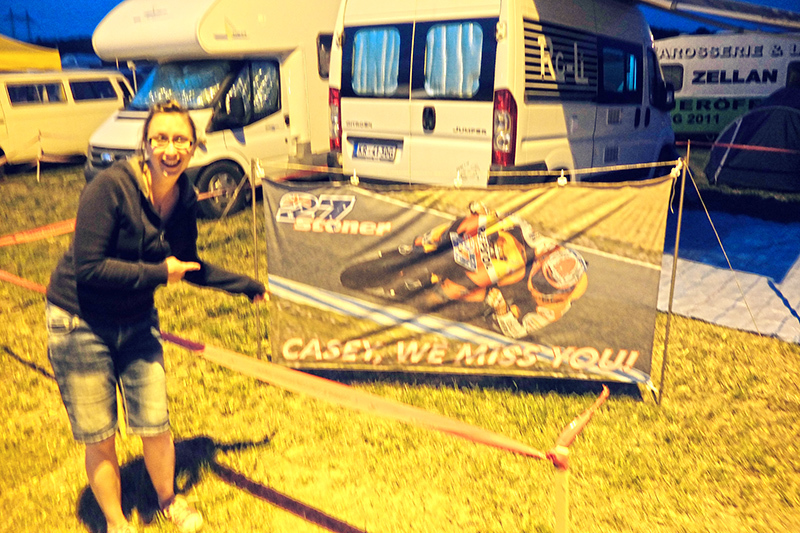 I remember over the years of watching Moto GP on Eurosport the commentators speaking of the madness of Moto GP campsites. It took us longer than expected to reach the campsite after going straight to the track for qualifying. After walking down the road away from the track, convinced we were heading in the right direction I finally relented and said that perhaps I had let us astray. We returned back towards the track and walked through the carpark towards the campsite. We approached the entrance gate and the stewards attending told us we needed passes to gain entry. We asked where we could go about obtaining said passes and were informed to go down to the next gate. So off we set, our bags growing heavy, our enthusiasm waning. We reached the next gate and were met with the same instructions. We look down beyond the gate and could only see a disheveled farm house and beyond that a motorway. 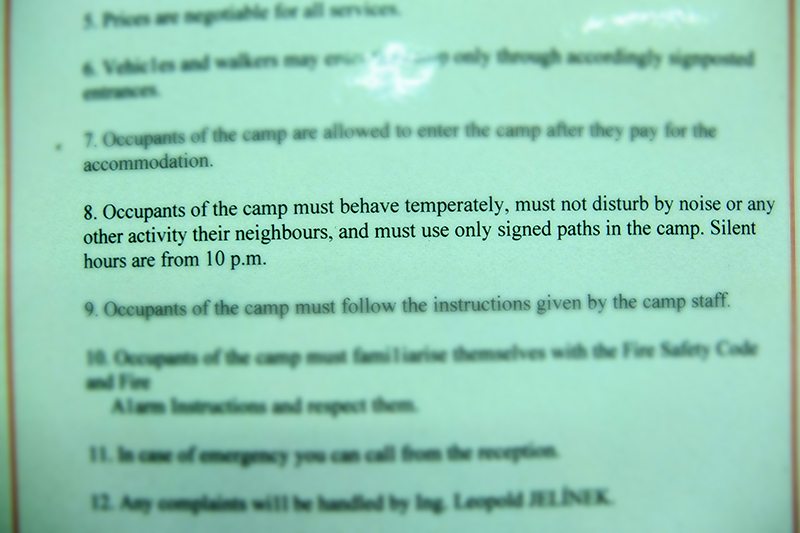 We began to think this was an in-joke amongst the campsite staff, send the stupid newbies on a merry walk around the perimeter for an hour. Eventually we arrived at the main entrance and paid our way in. At last we had arrived at our place of accommodation for the evening. We made our way through the outer edges of the campsite, past some encampments that had been settled for a long time. 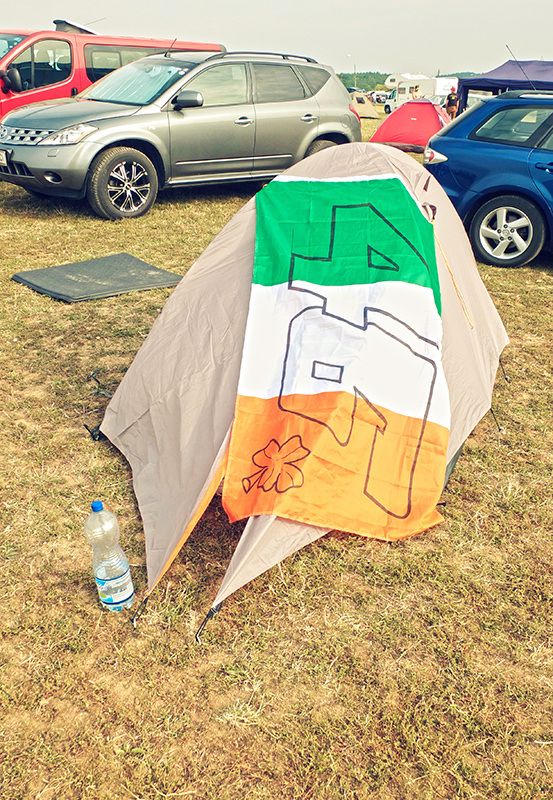 We had brought just a simple tent, plenty we thought for the one night we were to be there. And it was, plenty for us anyway. We didn’t need luxury, just a place to rest our heads for the night. We were to soon realise that would be very wishful thinking indeed. 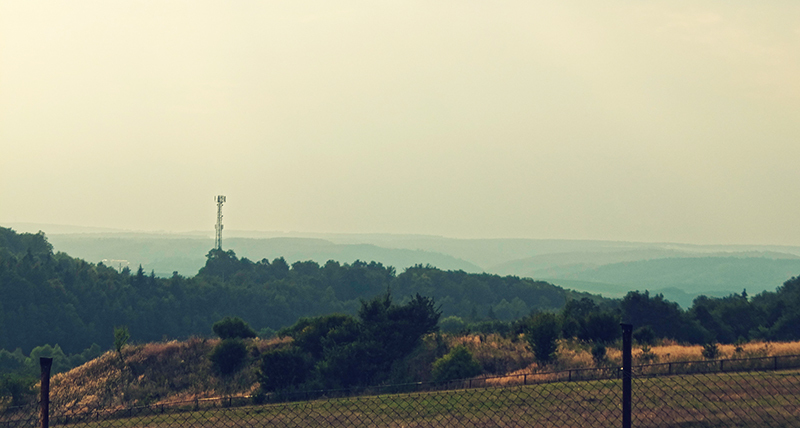 After walking past a number of tents, caravans and densely constructed facilities we found an area of free ground. It was on the southern edge of the campsite next to a fence separating two areas. The ground was dry as a bone and we soon realised that getting the tent pegs into the ground would be no simple matter. Thankfully a very friendly Austrian couple came to our rescue and offered their axe as a hammer to drive the pegs into the ground. Our humble tent, our home for the evening and our safe haven from the madness all around us. After setting up our tent we set about getting some food and quickly wolfed down the entire box of potato pancakes that we thought would easily last the whole weekend. Dang it! As we ate our lunch we noticed a routine starting to develop. Young kids on scrambler bikes were racing each other around the campsite, nipping between tents on their little bikes. They may have been small bikes but their audible output was anything but. I think their parents sawed the exhausts off as they were incredibly loud for such small machines. There were also a large number of adults cruising around the campsite on their machines constructed out of various motorcycle parts. The fuel tank may have said KTM or MZ but you could tell there were no original parts. These were machines produced in garages with random parts, an engine from one bike, suspension from another, wheels from another. And yet they ran, and boy did they run. Another bike went past, a massive Austrian flag on what looked like a broomstick wedged into a part of the bike next to the rear suspension. There was no seat, just a thin sheet of metal flooring drilled into the shape of a seat. Mmmm comfortable. The view from outside our tent was actually quite picturesque. Well in this direction anyway. After chilling in the tent for a little while and somehow managing to get some sleep, we decided to explore our surroundings a little more. We made our way to the “bar” at the entrance closest to the track. I ordered a beer and Sinead got a coke. We sat down and surveyed the scene around us. It was still early enough in the evening and people were still pouring into the campsite. 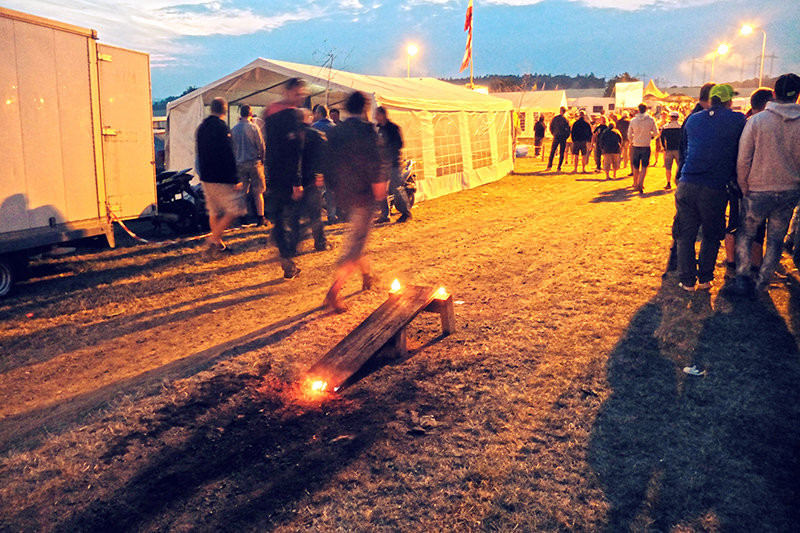 We sat around the bar area for a little while and had some of the delicious sausages being cooked at the beer tent. And then we decided to go for a stroll around the campsite and see the sights. And boy were there some sights…. A flaming ramp set up for the motorcyclists to jump over throughout the evening. As you do. Christmas Tree…Check. Car with police light…Check. Tiny paddling pool…Check. Yep this camp had everything they could possibly need for the weekend. Your own personal toilet seat. Now that’s a seasoned camper. Seconds after I took this, one of the fireworks detonated on the ground right in front a group of people. I don’t think there were any serious injuries but I do remember a girl patting down her jeans that had slightly caught fire. All normal activities for this campsite. 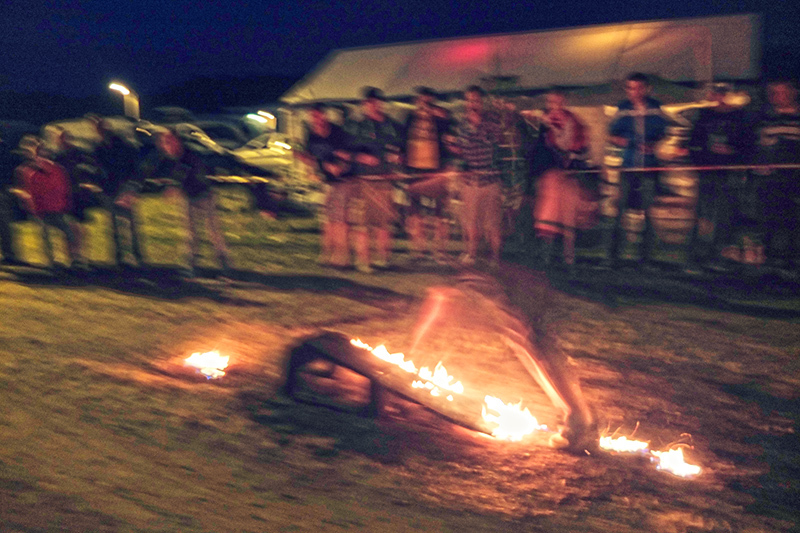 A man does his best motorbike impression as he runs and jumps over the flaming ramp. Most pointless and hilarious sign ever made in the history of pointless signs. I remember for years Toby Moody and Julian Ryder on Eurosport mentioning the motorbike engine hooked up to a gramophone, and I thought it couldn’t possibly exist…and then we saw it. Sure enough there was a motorcycle engine hooked up to an old fashioned gramophone, it was like that HMV advert, but laced with every drug imaginable. After walking around the campsite several times and witnessing some of the funniest things I’ve ever seen in my life we decided it best to get some sleep before race day. Some sleep? 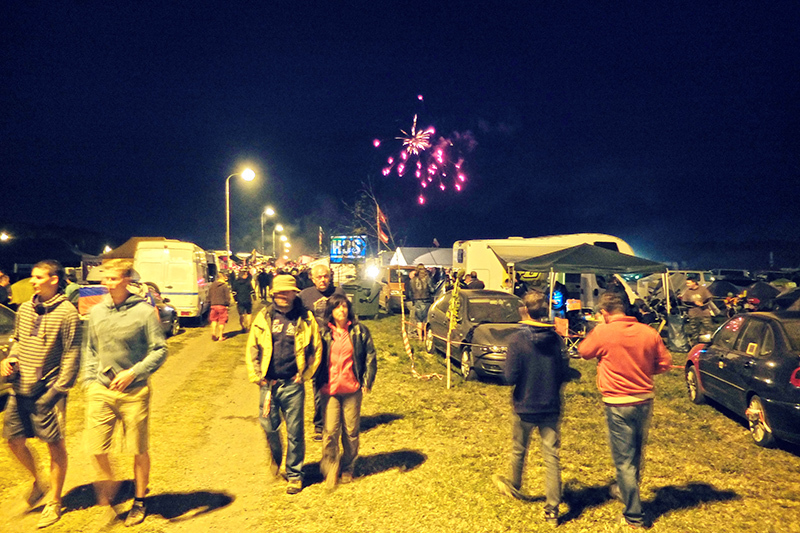 Whilst bikes with no exhausts raced around us, music blared from every tent and fireworks exploded mere feet away? Somehow, and I have no idea how, we actually managed to get a few hours rest. Having spent just one night there I can safely say it was the most insane place I’ve ever been in my life. It’s like the rules were…Do whatever the hell you feel like and worry about the consequences tomorrow. It was amazing. It was terrifying. It was wonderful. 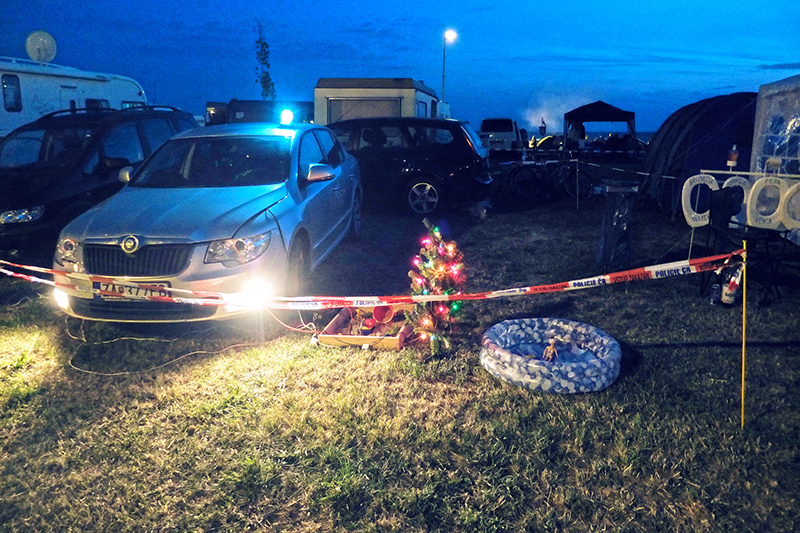 There are 2-3 bigger camp sites near the Brno race track during the MotoGP. Which one was it? Is it alright to reference this blog post in an ebook I’m wring?